Make this luscious dessert the day before you plan on serving to ensure that it is well-chilled and the ladyfingers have absorbed the flavors and achieve the right consistency. Use the crunchy ladyfingers, not the sponge-type that some supermarkets stock. They are typically available in the bread department of your supermarket or in the international food section. I found this recipe at inspiredtaste.com. Combine coffee, one prep bowl of the Marsala wine, vanilla extract and a tablespoon of sugar in a wide, small bowl. Reserve. Beat egg yolks, second prep bowl of Marsala, and 3 T of sugar in a bowl set over a saucepan of barely simmering water until tripled in volume, 5 to 8 minutes. Use a whisk or, to make things easier, a handheld electric mixer at medium speed. (Do not stop beating until removed from the heat). Remove bowl from heat then beat in mascarpone cheese until just combined. In a separate, chilled bowl, whip cream until it holds stiff peaks. Once the yolk-mascarpone mixture has cooled a little, gently fold in half of the whipped cream into the yolk-mascarpone mixture, then the remaining half just until fully incorporated (the whipped cream will deflate a little). Dip half of the ladyfingers very quickly into the coffee, and line the bottom of a 9-inch (23 cm) square dish. (You might find that you need to break a few into pieces to fit them in the dish). Spoon half of the mascarpone filling over the lady fingers and spread into an even layer. Grate half of the bittersweet chocolate over filling (optional). Then dip the remaining ladyfingers very quickly into the coffee and arrange a second layer over filling. Spoon remaining mascarpone mixture over ladyfingers. Grate more chocolate on top or dust with cocoa powder. Cover with plastic wrap and refrigerate at least 6 hours. When ready to serve, dust with extra grated chocolate or cocoa powder. Leave out at room temperature about 20 minutes before serving. 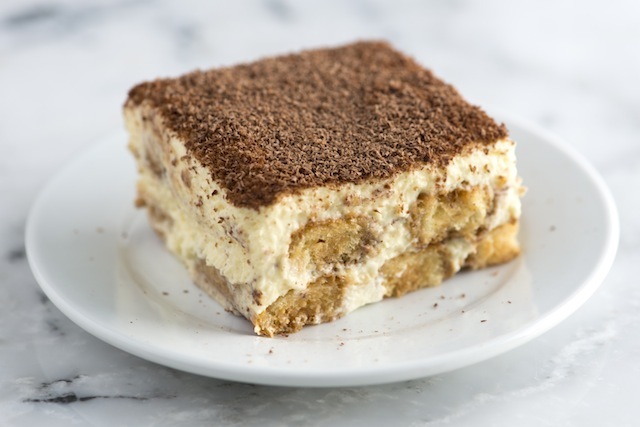 (Tiramisu can be chilled up to 2 days, but no longer or else the ladyfingers will break down too much). This entry was posted in Desserts, Recipes from Adrienne's pantry and tagged coffee, egg yolks, ladyfingers, mascarpone. Bookmark the permalink.